MULTIMEDIA-ENGLISH is a video-tube website designed to help you learn real English while having fun and offers good quality resources for teachers too. It uses authentic material to show you how real English works, mostly videos with transcriptions and explanations and interactive activities to help you assimilate the language while having fun. This site offers video pages for all levels, from beginners to advanced, including a section for kids and also for absolute beginners, plus a grammar section and also interactive activities to practise. So what are you waiting for? Don't just sit to study English, get into life through real English and enjoy it all the way. Multimedia-English was born with a very simple idea in mind: help people learn English, because today, people who can also speak English can get a better life and have access to more information and relationships. As a teacher and a social volunteer, I have been very sensitive to the educational needs I found in poor countries. I firmly believe that if we want a society to be free and leave poverty behind, the most important thing is education, and in today's global village, an acceptable knowledge of English is essential for that. That's why we must keep it free for users, even if that means moving heaven and earth trying to find some financial support to pay for all the expenses. So the aim of this page is to offer everyone from every country and social condition the best possible site I can offer. I am also very concerned with promoting the correct values to make better people and a better society. I do try to select material which is interesting, fun and entertaining, but there is plenty of excellent stuff for that and there is no need to use anything that can be degrading or damaging for our personal growth. I try to keep this website clean, acceptable for everybody of all ages in every country and from every culture, making sure that anyone in any situation will feel comfortable working with this material and will thoroughly enjoy the experience. Because everything you do, everything you see and everything you learn is constantly shaping your personality, we want to be a good influence while making sure you enjoy learning English and have fun. Everyone can have access to this website and all its sections for free, but if you register (also for free) you will have extra features and become an active part of the site. You will be able to upload your own video pages, create interactive activities, be part of a Virtual Classroom and many more things [see more info]. Additionally, you can also get into our Facebook page to practise your English with other students or teachers (no matter what your level is). When people go to an English-speaking country to learn, they are surrounded by real English and they slowly pick it up. This website provides you with a natural environment to do just so, pick the language up slowly and naturally, preparing you for what you are going to find when you meet English speaking people. The multimedia medium makes the material more real, more accessible and more fun. This is not a place to study, it is a place to relax, enjoy and let the language slowly get into you. Most of the language used here is authentic English not adapted to any specific level and taken from real sources. Though my language is British English, so that is the variety I use myself, the material on this site comes from different countries, especially the UK and the USA; there are even some non-native speakers too. That way, you train yourself to use and understand English as it is, the English used by natives (not the simplified, artificial language nobody uses in real life) and also by foreigners as an international lingua franca. The activities and videos are usually loaded with lots of help and explanations in case you need it. If your level is low, understanding the general idea is more than enough, or sometimes trying to understand a few things here and there will help you progress. If your level is advanced, then you should be able to focus on more difficult aims. Videos and interactive activities come in different levels, so you can also select the level you want to work with. 1- Scratch Course Designed for self-study. 365 videos that will help you progress from scratch (zero) to a basic command of the language in one year. Additional comments in English are optional. 2- Basic Real English Course This course will help you learn real English in context, so everything you learn, you can then see used in real life, just the way it is. It can also be used by teachers as an online "textbook". This course is also good for higher levels. See more information about it. 3- Kids Zone A section for children. This section is not designed to teach them English (though there's a lot of help on that too) but to let them pick up the language by watching the things they enjoy: cartoons, songs, etc. Children don't need much help to learn a new language, providing the right context, it's natural for them. This section can also be used by primary school teachers as a resource for their classes. 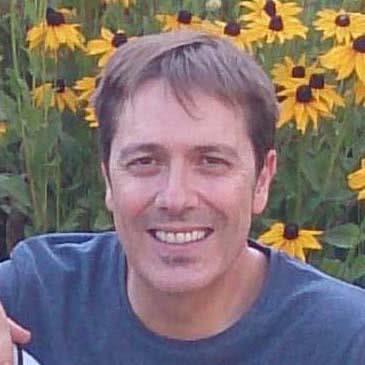 Angel Castaño has been teaching Spanish and English in Poole, Dorset (UK), and teaching English in Mexico, Peru and Spain. He's also been living in Oxford (UK) and Ohio (USA). At present, he lives in the awesome Spanish city of Salamanca (you can have an amazing virtual tour here) and he is a teacher trainer and a full-time teacher of English at the Official School of Languages in Zamora, Castile (Spain). These widgets are free, they have no nagging ads and they offer ever-changing quality content for your site, so go ahead and use this one or choose a different widget.